The Eurosceptic Alternative for Germany (AfD) is mingling with the British conservatives, searching for allies after securing 7 European Parliament seats in last Sunday’s election, but such an alliance could put significant domestic pressure on Merkel’s centre-right, experts say. EURACTIV Germany reports. 7% for the Alternative for Germany (AfD). As a result, the less than one year-old Eurosceptic party will send seven MEPs to the European Parliament. Now the AfD faces the question over which MEPs and which parties to cooperate with in the future, and whether it will join an existing political party group. The AfD is hoping to shake off its reputation as a right-wing populist party. Despite significant thematic overlap, the AfD has ruled out cooperation with Marine Le Pen’s Front National (FN), which won around a quarter of the votes in France, soon-to-be AfD MEP Joachim Starbatty told EURACTIV Germany. Hans-Olaf Henkel, who is second on the AfD’s candidate list, also said he ruled out cooperation with the FN, calling the far-right party’s success a “catastrophe”. Henkel’s coalition partner of choice for the AfD would be the European Conservatives and Reformists (ECR) and the British Conservatives, he said. The former head of the Federation of German Industries said he could easily imagine a coalition with the Tories. A meeting, Henkel said, was already held on Tuesday evening (27 May) for the first round of talks. The Tories are the strongest force in the ECR Group. The Polish Law and Justice party, under the leadership of Jaros?aw Kaczy?ski, is also represented in the political group. “They have a lot of overlap with us because they are also against the European central state. They are liberal and also values-oriented,” Henkel explained. But David Bebnowski from the Göttingen Institut für Demokratieforschung sees another reason why the AfD could desire to join the ECR’s ranks. Membership in the ECR would be a “big advantage and have significant symbolic power”, Bebnowski said. The party would belong to a notable political group, Bebnowski explained, “relatively solid and centric” with the Tories as their partners, and could put the centre-right Christian Democratic Union (CDU) under pressure domestically. The first exploratory talks with the ECR already took place before the elections, Lucke confirmed on Monday morning. These commenced “in a very good atmosphere”, he said. Michael Kaeding from the Universität Duisburg-Essen doubts whether the AfD will join the ECR political group. “Such a joining […] could go wrong”, the political scientist told EURACTIV Germany last week. And German Chancellor Angela Merkel could personally be responsible for such a failure, he said. Up until now, the ECR has been an important majority-bringer for the European People’s Party (EPP), of which the CDU/CSU is also a member, said the European politics expert. If the AfD were to become a member of the ECR, it would have a “very significant European platform”, Kaeding explained, a situation which would not be in Merkel’s interest because the EPP would then have to form a coalition with the AfD. Kaeding sees a higher probability for the AfD joining the Europe of Freedom and Democracy (EFD) group. The AfD’s positions are quite close to the parties in the EFD, the political scientist indicated. In addition, the political group would undoubtedly be interested in accepting a newcomer from Germany, Kaeding explained. “The EFD will attempt to recruit the AfD, because the political group’s existence is under threat,” Kaeding explained, indicating that the EFD needs enough people from enough countries to maintain its status as a political group. One problem, from the AfD’s perspective, is posed by the United Kingdom Independent Party (UKIP). The UKIP’s leader Nigel Farage is one of the chairmen of the EFD Group, along with Francesco Speroni from the Italian Lega Nord. “Often there is an impression that UKIP belongs in the same corner as the Front National or Geert Wilders. But of course that is not the case. 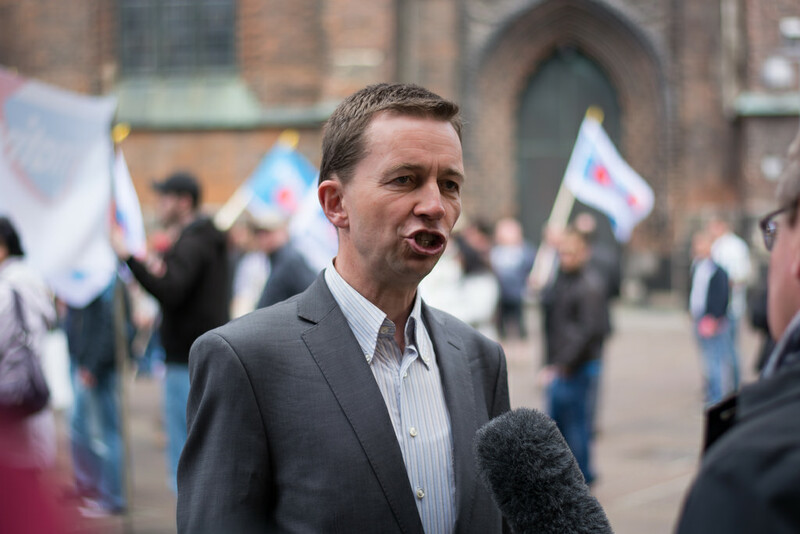 The UKIP is very clearly a democratic party,” Lucke pointed out, choosing his words carefully. But at the same time, UKIP represents different views from the AfD regarding the future development of Europe. The British party is hoping for a UK exit from the EU, the AfD chief said. “In that sense I do not see any commonalities”, said Lucke. An alliance with UKIP would be “a death sentence for the AfD”, said Bebnowski. The UKIP is considered right-wing populist, in Germany and this image would hurt the AfD, not least after its rejection of coalitions with right-wing populist forces. Should the AfD not join either of the existing Eurosceptic political groups in the European Parliament, a remaining option would be to form a new faction itself, said Bebnowski. But to do this, the party would have to assemble at least 25 MEPs from at least 7 of the 28 EU member states. Eurosceptic parties around Europe have shown their willingness to act on a European level. The controversial Dutch far-right leader Geert Wilders and leader of the extreme-right Front national in France, Marine Le Pen, have led the initiative to form a new group in the European Parliament, together with like-minded parties. Other parties, including the British UK Independence Party (UKIP) and the Danish Popular Party, rejected outright the proposition. Oh yes, I’m sure Cameron would just love to have a party opposed to Angela Merkel in the ranks of the stupid ECR he set up. After all, he is constantly banging on about his close relations with Merkel, how she supports British positions, and is desperate to have her on his side for whatever his British referendum plans are (never specifically stated). Yes, definitely, Cameron must be so enthustiastic about having the Conservative party allied with opponents of Angela Merkel. Either the British Conservatives are serious about developing a Europe wide alternative to the federalists’ plans or they are not. If they are they have to join with the AfD.